Have a Blessed Christmas & a healthy, peaceful 2017!!!! With Christmas and the New Year within our reach again, a word of gratitude and hope is essential and very welcome too. Looking back and looking ahead…..
First of all we like to send a huge thanks from the bottom of our hearts, to all our true supporters, sponsors, volunteers, (assisting) caretakers, (symbolic) adoption parents…friends and family…who through good and bad times are there and have faith in what we do, loving our ambassadorcats of all species (see mentioned below) with all their hearts. 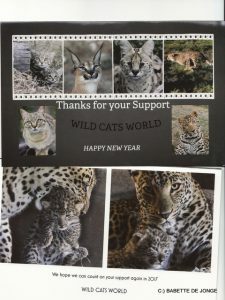 Without you all, it would be far more difficult and above all far less fun to keep the fight for the wild cats going, in natural habitat, in our one captive project (sanctuary/conservation project) and in all other projects undertaken with our foundation Wild Cats World. 2016 was a year of mixed feelings again. There’s always the great sorrow to hear how many wild cats and other wildlife are endangered and killed (for fun and greed), and how few there are left. The sabotaging of forest departments and nature orgs, making it almost impossible to do good for the cats (esp. as for releasing and free ranging projects….) in both Indonesia (Java) but also in South Africa. In small there’s also the usual hassles at the sanctuary/conservation project in South Africa. People wanting to make it difficult for us, or criticising without knowing what you are actually doing. So not helping but obstructing the best care and future for the cats we love and respect so much. But there were meetings with new great people, private game reserves, (assisting) caretakers, volunteers……which gives hope for the future, hope for the New Year. There were some essential births, which also gave ourselves joy and heartache. 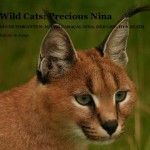 Some were successful like with leopard Felicia, African wildcat Louise and in some, no matter how great the first time mommies were, sadly no survivors, as for serval Joy and caracal Nina. But new hope on the horizon, first of all for Joy, who will soon have another chance and we feel convinced signs are better now. There were sad losses in 2016, like in every year. Apart from the few new borns, also serval Mick and black-footed cat female Beauty, both to kidney failure. It was so sad having to let them go. R.I.P to our two darlings, who will never be forgotten. Apart from losses also a few great new additions: serval male Norrick and black-footed cats Lilly and Spotty. And of course the new-born survivors Solo (leopard), Stars & Stripes (African wildcats). A big thank you and we hope we can count on your support again in 2017 and the coming years!!! !